Hi Nabeel, To get CAD files you pretty much have to reverse engineer them for your self. I’ve been working on mine (on and off) over the last three years (using Onshape). Nice, nylon for the gears and splines should work a treat. Good initiative, nylon printing is very good for all the gears and wormgears. I tested some Nylon printed piston in the bicep for a while and it was pretty smooth and strong. I made some test dove tails and they went together very nicely. I did find that there was some flexing/distortion so I’m adjusting. Was there an engineering reason for that style of dove tail? I think that a function called “loft” would be the tool for the task. It would involve sketching the profiles at various points along the arm then lofting through them. Did you try to print them to see how the parts fit and hold together, once the the 0,3mm gap is added? This looks great and seems to run really well. I\’ve become concerned about the application of servos this way. Have any had the drive shaft get pulled out of the servo in these linear actuator applications? What about the place where the little screw holds the servo horn onto the splined shaft, any failed there? I’ve been working on truing up the Torso plates to get them to align better using a parametric modeler. Hopefully that will make adjustments easier and actuate. Here’s where I am so far. I’m trying to keep the parts as close to the originals as I can for this exercise. It seems very good Reece! 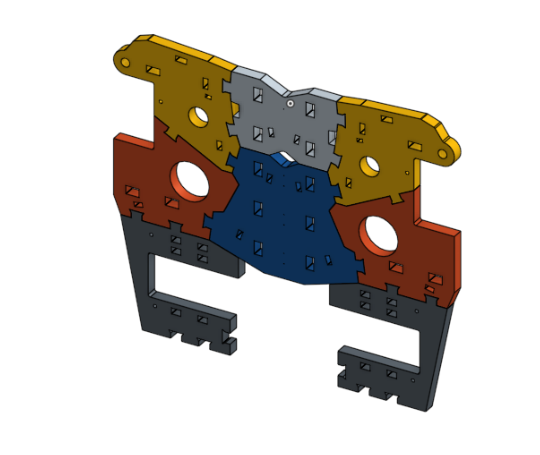 I wonder if OnShape can open the more sculptured shapes like the for arms cover?